Expedition 59 Flight Engineers Nick Hague and Christina Koch will exit the Quest airlock Friday for about 6.5 hours of battery swaps to upgrade the station’s power storage capacity. 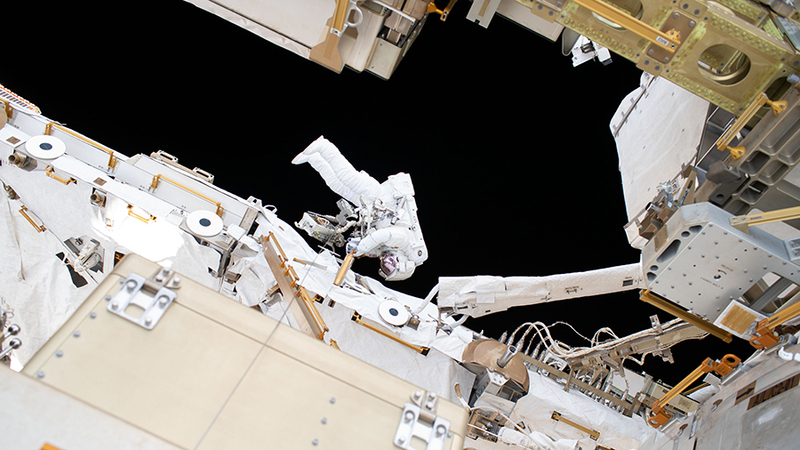 The duo will set their spacesuits to battery power about 8:20 a.m. EDT Friday signifying the start of their spacewalk. Coverage will begin its live coverage at 6:30 a.m. This will be the 215th spacewalk in support of space station assembly and maintenance. 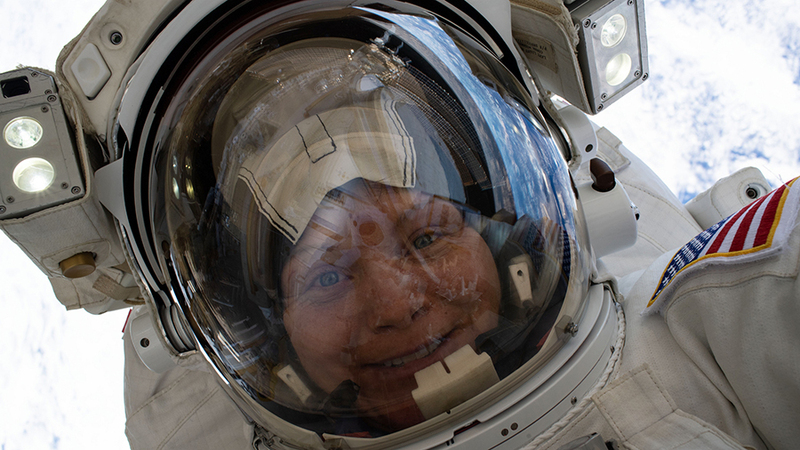 Hague will be designated extravehicular crew member 1 (EV 1), wearing the suit with red stripes. 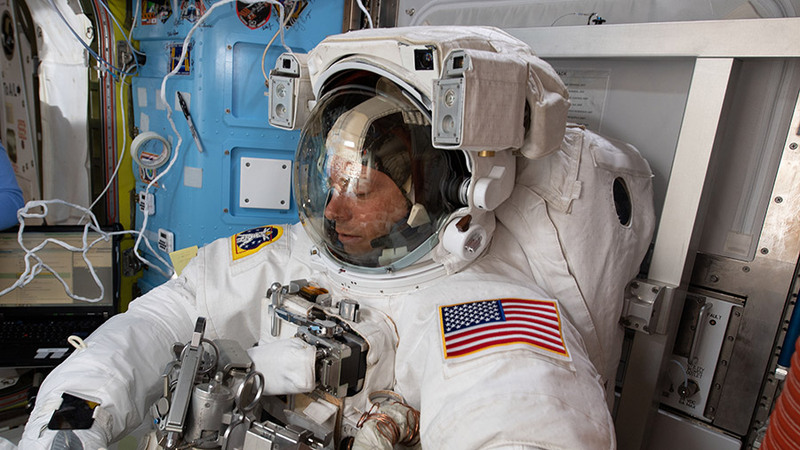 Koch will be designated extravehicular crew member 2 (EV 2), wearing the suit with no stripes. 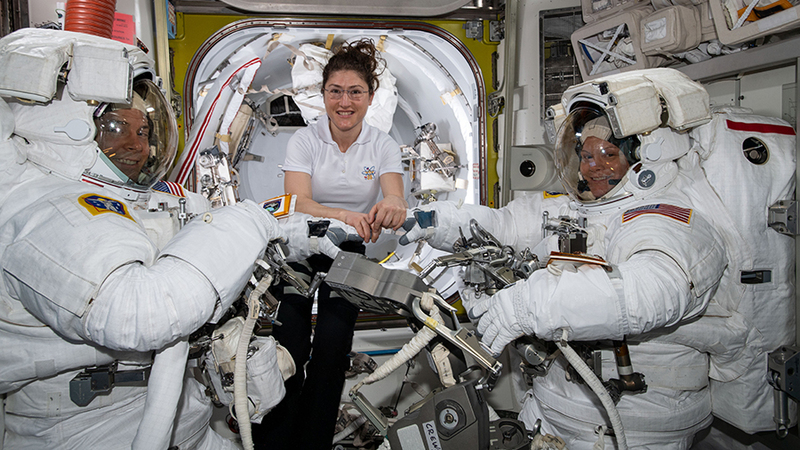 Hague and Koch have configured their spacesuits and reviewed procedures for tomorrow’s spacewalk at the space station. Robotics controllers also readied the Port-4 (P4) truss structure so the spacewalkers can continue battery swaps and power upgrades outside the orbital lab. This is the second battery replacement spacewalks this month. 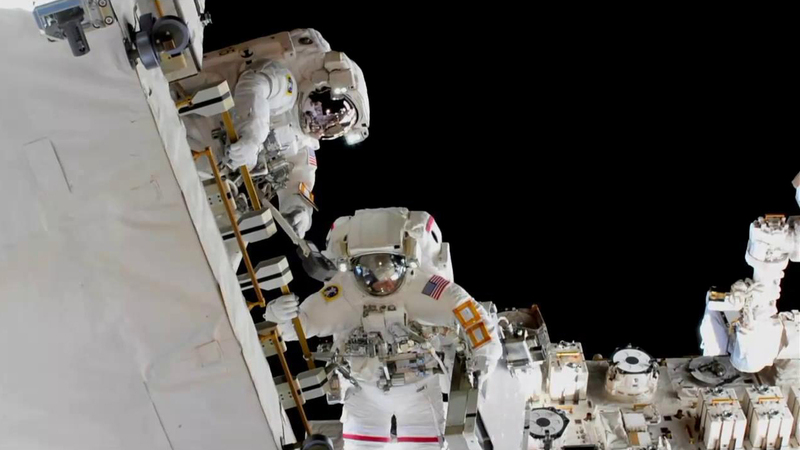 Hague and Koch will work on a second set of battery replacements on a different power channel in the same area of the station from the recent spacewalk on March 22. 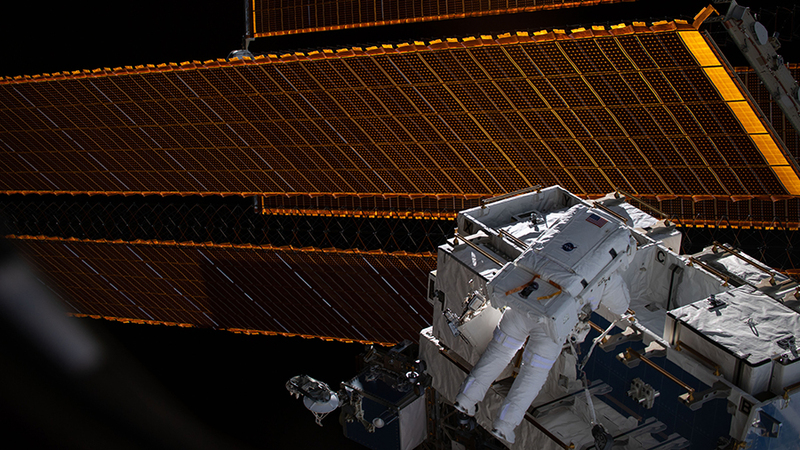 During that spacewalk, NASA Flight Engineer Anne McClain and Hague replaced some nickel-hydrogen batteries with newer, more powerful lithium-ion batteries for the power channel on one pair of the station’s solar arrays. The batteries were transported to the station in September aboard the Japanese H-II Transfer Vehicle. 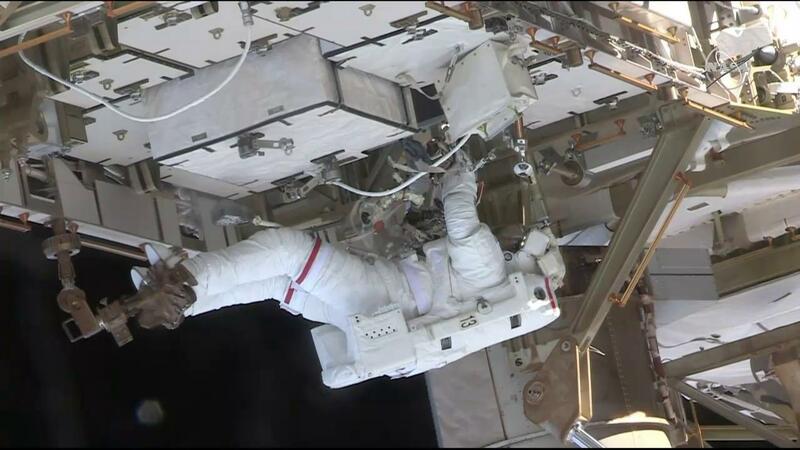 The spacewalking work continues the overall upgrade of the station’s power system that began with similar battery replacement during spacewalks in January 2017. 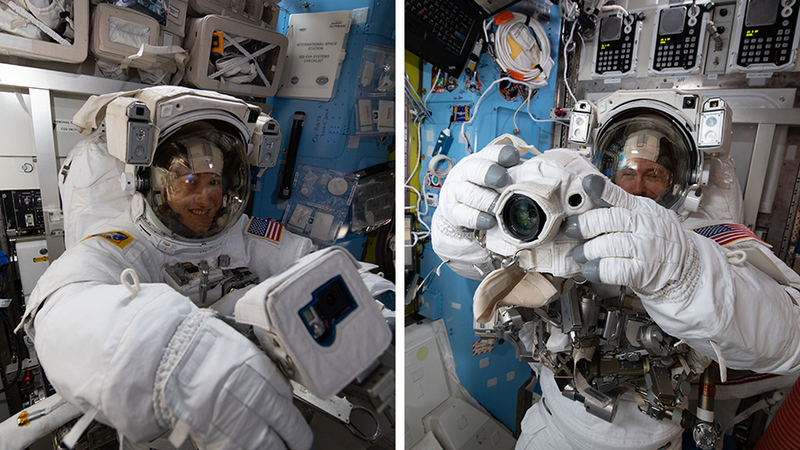 NASA astronauts Christina Koch (left) and Nick Hague are fitted in U.S. spacesuits and check out spacewalk cameras inside the Quest airlock. Flight Engineers Nick Hague and Christina Koch will exit the Quest airlock Friday for about 6.5 hours of battery swaps to upgrade the station’s power storage capacity. 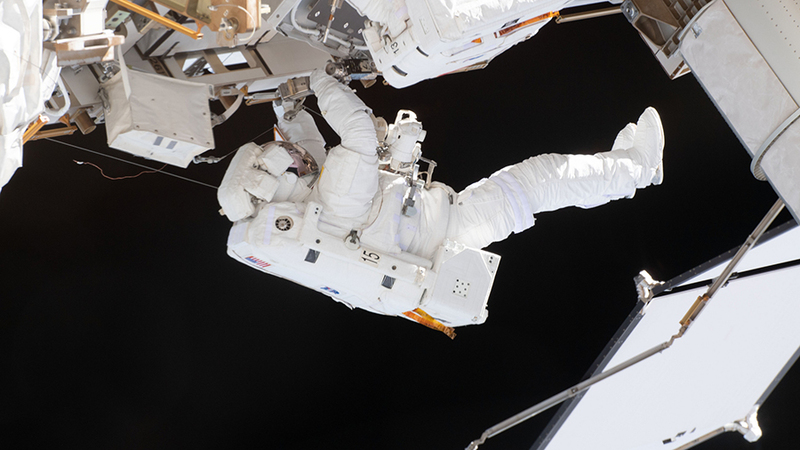 The duo will set their spacesuits to battery power about 8:20 a.m. EDT Friday signifying the start of their spacewalk. NASA TV will begins its live coverage at 6:30 a.m. While Hague and Koch were organizing their spacewalk tools today, the duo had time to research how blood flows to the brain in microgravity. Koch took Doppler waveform measurements of her arterial blood pressure for the Cerebral Autoregulation study. Hague then closed out the brain blood-flow experiment and stowed its gear in the Kibo lab module. Astronaut David Saint-Jacques of the Canadian Space Agency was back on spacesuit duty today cleaning cooling loops, checking tools and readying the SAFER jetpacks. He later worked on a wearable device, the Actiwatch Spectrum (AWS), which measures an astronaut’s daily wake-sleep cycle, or circadian rhythm. The AWS provides doctors insights into sleep quality, sleep onset and ambient light quality aboard the orbital lab. NASA astronaut Anne McClain also assisted with the spacesuit work today checking the SAFER jet packs and reconfiguring the U.S. spacesuits. She also worked on a science freezer and trashed obsolete ultrasonic hardware designed to detect pressure leaks.